First off, sorry for the late story. It’s been a busy week for the Bass Rankings team, with MANY big tournaments and some key updates we were making to the site. But enough about us, let’s look at the rankings! 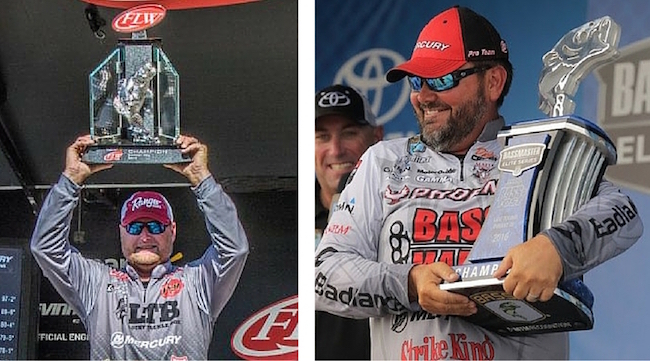 By now you know the facts: Jason Lambert nearly eclipsed the century mark in winning the FLW Tour event on Kentucky Lake; Greg Hackney flipped and pitched his way to victory during BASSfest on Lake Texoma. Both were huge victories, for different reasons. Aside from the big check and the berth into 2017 Bassmaster Classic, Hackney’s win also jumped him to No. 1 in our one-year Majors Ranking. As in, he’s been the best angler in the sport the last 365 days. That said, his official two-year ranking didn’t budge much from 15th. Why? Because he dropped off his 2014 FLW Tour victory on Pickwick the same week AND a sixth-place finish last week. So his average actually dipped … for now. At the end of this month, Hackney will drop off his worst finish in years (a 138th at Kentucky Lake), and when that happens, expect to see his average and ranking sky rocket most likely into the top 10. As for Lambert, his victory marked his second six-figure payday of the season, as he won a loaded FLW Costa event earlier this season. Considering he has no shot at making the Forest Wood Cup – where he would’ve been a favorite – he’s more than made up for it with this latest win. As for his ranking, he had a miserable spring outside of the lone victory. So even with his win he’s still ranked 197th in the two-year Majors Ranking. As for the rest of the two-year rankings, there was plenty of movement with both tours going. Aaron Martens had a prime opportunity to possibly jump into the top spot, as he dropped an awful 2014 BASSfest tournament. Problem is, he stubbed his toe again this year. So his average ticked up, but only slightly. So he’s still in third. Meanwhile, many guys made hay at BASSfest, as Keith Combs, Chris Zaldain, Jordan Lee, Dean Rojas and Bobby Lane all solidified their top-10 rankings. The big drop was John Cox. The former No. 1 has slipped to eighth after two lack-luster finishes in a row.